But change is afoot. In fact, according to Deloitte’s 2017 study into Human Capital Trends, as many as 79% of executives rate performance management redesign as a high priority. The model the vast majority are looking to adopt? Continuous performance management – a holistic approach to employee performance that utilises regular touch-points throughout the year to track progress against assigned targets, provide constructive feedback, and work on development areas. The answer here is really very simple: traditional annual performance reviews have been shown to be ineffective and, in many cases, damaging to employee engagement. The irony here is that poor performance management practises can negatively impact the very performance they’re attempting to quantify. Yearly appraisals are predominantly focused on performance measurement, often tying outcomes into the compensation review process. But ranking employees against one another is a sure-fire way to promote discord, decrease engagement, and engender negative behaviours. Understanding the effectiveness of individuals in your organisation is clearly an important output of your appraisal cycle, but it’s only one side of the equation. Performance management is at its most effective when it recognises that it is not only a tool for measuring employee performance, but also for improving it. Through regular monitoring, continuous performance management allows for development of the workforce as the appraisal cycle progresses. Recognising achievement throughout the year reinforces good behaviours, improving employee engagement through regular feedback, while areas of weakness can be pinpointed as they arise, and bespoke coaching provided to address them. It’s this increased scope for agility that is the real power behind the continuous performance model. Why wait twelve months to discuss feedback at the conclusion of an important project when instant, constructive feedback would be so much more valuable? Why tell an employee that their performance isn’t up to standard when targeted coaching earlier in the year could have corrected the problem? Why hold employees accountable for objectives that may, through the course of the year, have become obsolete or irrelevant? 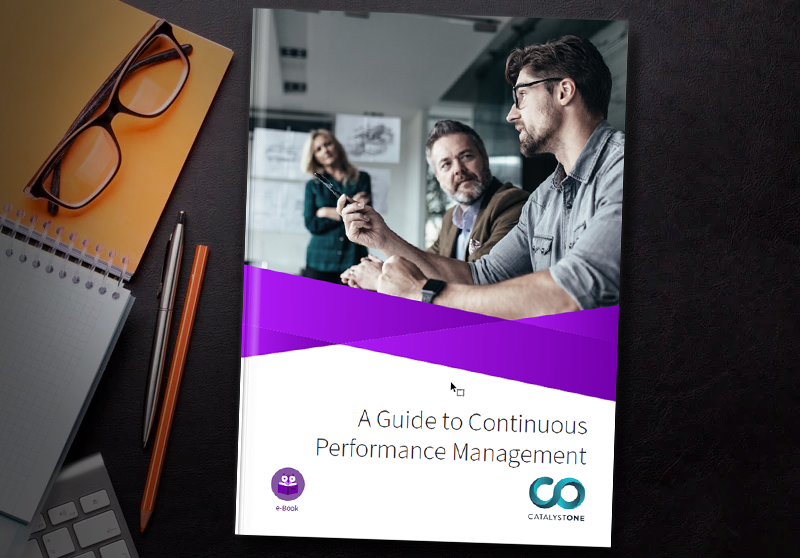 Continuous performance management is an incredibly powerful, flexible tool, and many of the world’s leading organisations are already implementing it. 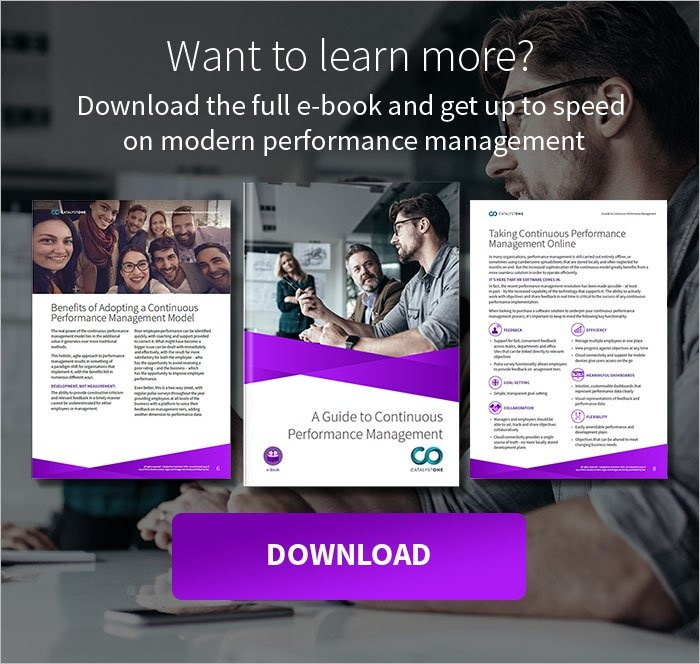 From Adobe to Goldman Sachs, forward thinking businesses are harnessing the power of an agile approach to performance management. One thing above all others has driven this industry-spanning change in performance management methodology: technology. For many organisations, the appraisal process is an enormous undertaking. Often carried out offline, it can be hugely time consuming and resource intensive. This is where specialised software can streamline what would once have been a logistical challenge. Removing the manual element not only makes it easy to carry out regular assessment of targets, schedule meetings and keep the focus on development and coaching, it also frees up managers and employees alike to do the jobs they’ve been hired to do. CatalystOne Status reviewer – part of our suite of performance management software –allows managers to keep track of employee objectives and development plans in real time, providing feedback when it’s needed most instead of months down the line. How is performance management handled in your organisation? Is it time to consider a continuous model?